Email newsletters are a great way to keep in touch with your valued clients and prospects so you can continue to build relationships and remind them what you do and how great you are at doing it. Not only that but email marketing is a cost-effective way to market your small business. The people on your mailing list will have self-selected into your list, that is they are saying, I want to hear from you. 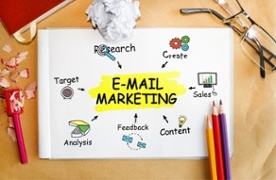 And having a regular email marketing campaign, such as a monthly email newsletter, it will help build your business, keep you top of mind and increase your sales. Speak directly to your readers by talking about them and not you. By using the word ‘you’ rather than ‘we’ your newsletter will be more engaging, and people will be more likely to read it. Once you’ve written your email check it for the word “we” and when you find them reword the sentance or paragraph so it’s 100% focused on your reader. The chances are that your readers don’t want to read about your wonderful products or services. They are actually interested in how they can solve the problems they’ve got so keep your email newsletter educational and make 80% of your content helpful and useful to your audience and keep the self-promotion down to 20%. The hard sell is dead. Too much self-promotion turns people off and people will either just delete your emails without opening them or they will unsubscribe. The only time you should deviate from this rule is if you have an exciting piece of news about your product, service or company. People don’t have the attention span to read long emails; so don’t cram too much information into the email. If you’ve got a lot to tell people write it up in individual separate blog posts or news items on your website and link to them with a bit of teaser text. You also don’t want too many different calls to action (CTA) in your newsletter. Pick a primary CTA and give it pride of place, then consider other CTAs as just-in-case-you-have-time. These secondary CTAs could include Forward to a Friend or Share on Social Media. Images in emails help engage your readers but they can also be problematic because not everyone has images switched on. Alt Text is the alternative text that appears when images don’t loaded in an email or on a web page and it tells your reader what the image is about (it’s also useful for SEO). Alt Text especially important if you are using an i to domage as a CTA. You want to make sure people are clicking even if the image doesn’t download, so make your Alt Text decriptive and tell people what you want them. Don’t assume everyone will remember you so always put a bit about what you do and your contact details at the bottom of each email. Use these simple copywriting tips in your next email and you’ll stand a better chance of people engaging with your newsletter, which will enable you to build relationships that lead to sales. What is successful for you when you send your email newsletters? Share your tips with us in the comments below. This article originally appeared in Spindle Tree Copywriting Blog. This article was written by Kassia Gardner from Business2Community and was legally licensed through the NewsCred publisher network.